← The bridge from Germany to the U.S.
Peter J. Trares – 1st photo of a Trares ancestor! 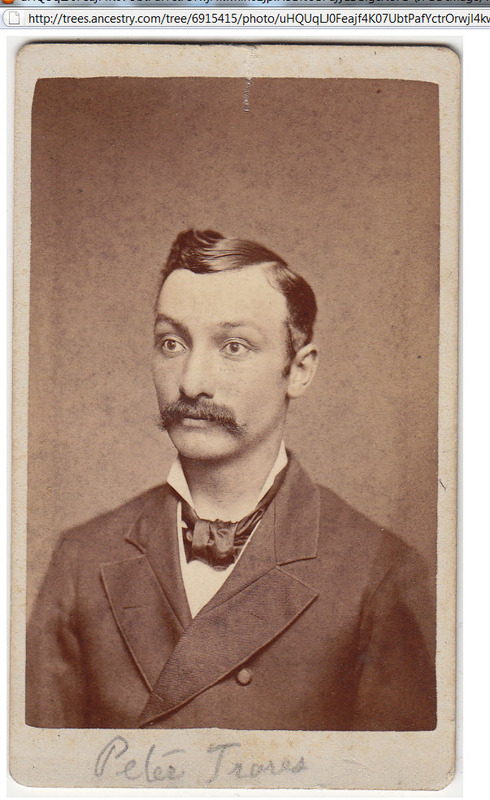 I ran across a family tree on ancestry.com the other day that featured the first photo of a TRARES that I have run across during my research. The photo is of Peter J. TRARES, born 24 Aug 1859 in Suffield Twp., Portage County, Ohio to John Lewis TRARES and Nancy Maryann KNAPP. You can click on the photo to view a larger version of this image. He married Susan KNAPP, daughter of John R. KNAPP and Margaret M. ENGLEHART, on 31 Aug 1857 in Portage County, Ohio. If you’re wondering where he fits into the KNAPP family tree, you can click this link to view a family tree, which will give you some perspective on where he “fits” into the big picture. Augusta TRARES: She was born in 1883 in Portage Co., Ohio and died 9 Dec 1966 in Akron, Summit, Ohio. She married Austin Francis JACOBS. Francis and Augusta had 8 children. I won’t list all of them here, but I do have their names. Victor John TRARES: He was born 10 Jul 1886 in Suffield Twp., Portage Co., Ohio and died 12 Jan 1959 in Alton, Madison County, Illinois. On 14 Jan 1908, he married (1) Bertha Johanna Hildegard STOLZE in Illinois. Bertha was born 14 Jan 1885 in Edwardsville, Madison County, Illinois and died 2 Jan 1978 in Alton, Madison, Illinois. I believe they must have divorced, because Victor married (2) Carmen COURTNEY on 28 Nov 1935, location unknown. Note: Edwardsville, IL should ring a bell because that is where John Sebastian TRARES moved to establish his pharmacy. [Read more about him in some of my older posts.] In doing some additional research, I located Victor’s WWII draft registration card, which lists a Jerome TRARES as a contact. 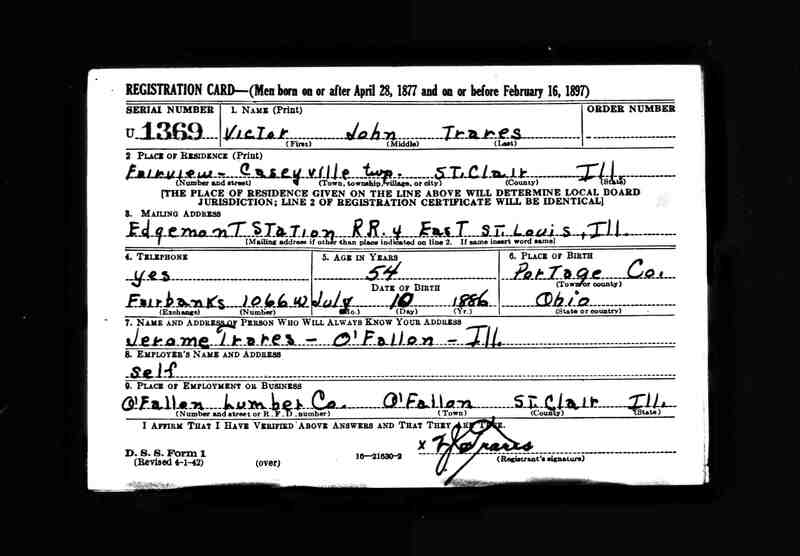 Jerome TRARES is Victor’s son and died in 1995.You can view a larger image of his WWII draft registration card by clicking on the image below. Victor also had a daughter named Helen TRARES. It is also interesting to note that Victor’s uncle, Henry TRARES, migrated to Edwardsville, IL to work with HIS uncle, John Sebastian TRARES, in his pharmacy. So we have a whole western branch of the TRARES clan! Alphonse Henry TRARES: He was born 19 Dec 1889 in Portage County, Ohio and died 2o May 1961 in a long-term care facility in Holmes County, Ohio. He married Grace A. BOOSINGER. Note: And a big thanks to Clare Myers, a granddaughter of Alphonse TRARES and Grace A. BOOSINGER, for confirming Grace’s maiden name in a comment sent Feb. 25, 2010. Thanks, Clare! Joseph P. TRARES: He was born 22 May 1892 in Suffield Twp., Portage Co., Ohio and died in 1957. Clara TRARES: She was born in 1895 in Suffield Twp., Portage Co., Ohio. Mary A. TRARES: She was born in 1897 in Suffield Twp., Portage Co., Ohio. Florence TRARES: She was born in 1898 in Suffield Twp., Portage Co., Ohio. Hilda TRARES: She was born 3 Aug 1883 in Suffield Twp., Portage Co., Ohio and died 9 Dec 1966 in Cuyahoga Falls, Summit County, Ohio. If any of the western branch of the TRARES family wishes to share more information, please feel free to comment on this post – or send me an email via Knapp Notes. This entry was posted in Family History, Genealogy How To's, Germany, Hessen, Knapp, Photos, Polls, Portage County, Trares, Uncategorized and tagged Edwardsville Illinois, John Sebastian Trares, Mark Knapp, Trares. Bookmark the permalink. 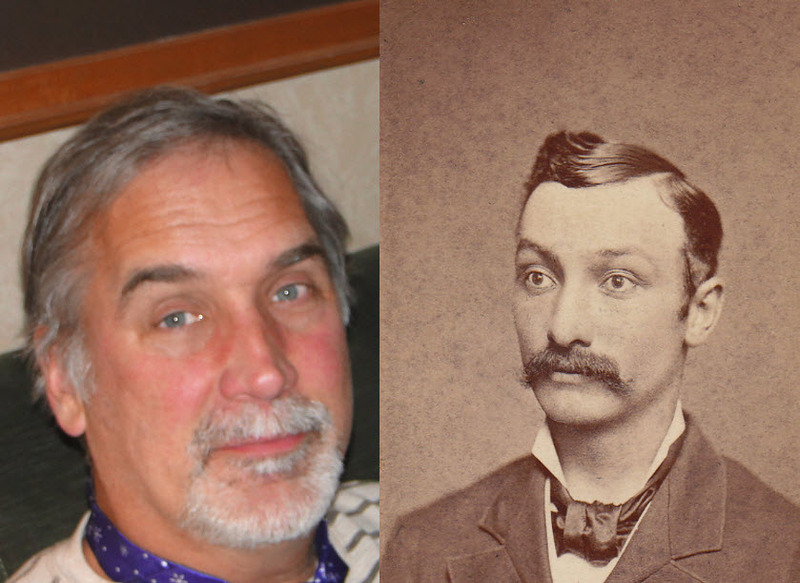 8 Responses to Peter J. Trares – 1st photo of a Trares ancestor! This is so awesome. I just started doing some family research and to come across “the Trares saga continues…” is hilarious. Joan is my Great Aunt, and JJ Trares is my great grandfather. Thanks so much for all the research you have been doing. Its really cool to find! Glad this you found the information on this blog helpful. That has always been one reason why I do this – to help descendants reconnect and help each other to fill in some of the gaps in our respective family trees. Please feel free to email me directly. See the About page for more information. I found out his grandfather was Henry Trares 1855-1935 and my great grandfather Peter J Trares 1859-1916 were brothers born to John L Trares 1825-1904 and Nancy Maryann Knapp.. I would like to continue the “search” and connect the dots. I am a great granddaughter of Peter Trares. Yes, they look very much alike! For the record, the wife of Alphonse Trares was my grandmother, Grace Boosinger. Bartlett was a mistake. Thank you for clarifying that bit of information for us! I will correct the information right away. I appreciate the help! Wow…..that’s cool….they look so much alike!